(Shampuyacu, Peru) Photo by Bruno Locatelli/CIFOR. Alert systems that quickly connect observers to the location of tree cover loss can help forest managers respond to threats with precision and speed. These alerts allow large-scale monitoring of tree cover loss using satellite datasets and sophisticated computer algorithms to understand how the forest is changing over time, without having to trek through remote areas or wait for yearly data updates. A new collaboration between World Resources Institute and the International Center for Tropical Agriculture (CIAT) lets users of the Global Forest Watch (GFW) platform visualize and analyze tree cover loss alerts for all of Latin America with a near-real time deforestation monitoring system called Terra-i. A project of CIAT, Terra-i is a pivotal addition to the GFW platform. It enables users to put tree cover loss alerts into context with data on relevant forest cover, community and biodiversity for an increased understanding of where—and why—forests are disappearing. Terra-i is the highest-resolution alert system on GFW, with resolution as high as 250 meters (273 yards), and able to deliver updates monthly. Because forest monitoring technology is in its early stages, multiple alert systems on a single platform help users compare and contrast results. Terra-i’s algorithm is specifically calibrated for Latin America, it has a high level of accuracy, and there are plans to expand the system next year to cover the pan-tropics at the same high resolution. Terra-i uses satellite imagery from NASA’s MODIS (Moderate Resolution Imaging-Spectrometer) and TRMM (Tropical Rainfall Measuring Mission) sensors to detect tree cover loss through a computational algorithm designed to detect changes of greenness over time and relate them to rainfall. When a significant deviation from normal vegetation patterns occurs, the area of change is marked, resulting in an alert on the GFW map. With the addition of Terra-i near-real time alerts, Global Forest Watch now offers four tree cover monitoring systems that generate periodic alerts for Latin America. GFW users can compare these monitoring alert systems not only with other contextual data (e.g. protected areas), but also compare alert systems with one another to see where changes are most frequently observed. This allows for better data verification and increasingly accurate forest monitoring. 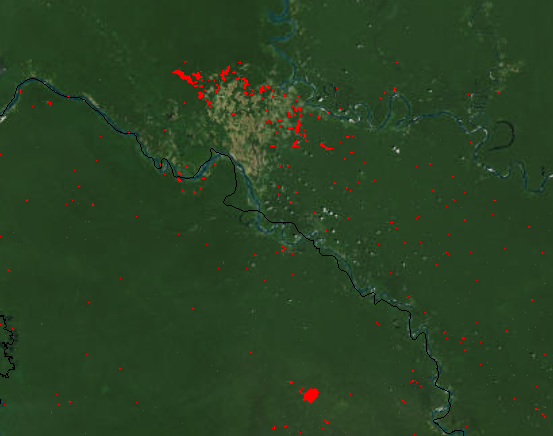 With monthly alerts for all of Latin America, Terra-i offers a unique opportunity to monitor local environmental issues such as illegal mining, which is a widespread driver of forest loss in parts of the Amazon Basin. For instance, the Madre de Dios Region of Peru has been the focus of Terra-i alerts for several years, as it became the hub for Peru’s gold industry. As international gold prices rose, and a new highway opened access to previously remote forest, unregulated and illegal mining activities in the area have led to an increase in forest clearing for mining sites. Terra-i data estimated that Madre de Dios lost 28,369 hectares (about 70,000 acres) of vegetation over an eight-year period (2004-2011), with an annual average loss of 3,546 ha (about 8,800 acres). 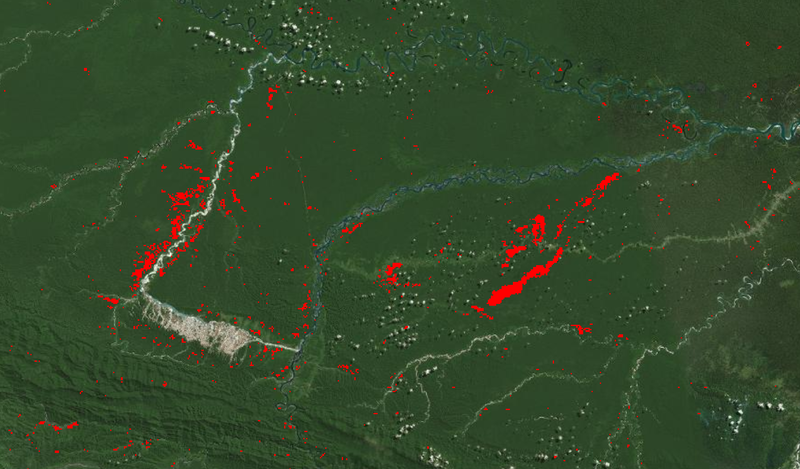 Terra-i data shows that Peru has lost 243,211 ha (more than 600,000 acres) of vegetation since 2012, with 23,224 ha (more than 57,000 acres) of that loss (9.5 percent) in Madre de Dios alone. Terra-i monitoring data can be used to inform efforts to address illegal mining in the region by helping to identify priority areas for action and document the seasonality of mining activities. Knowing the amount of forest loss can likewise help officials estimate assess the effectiveness of efforts to address illegal mining over time. 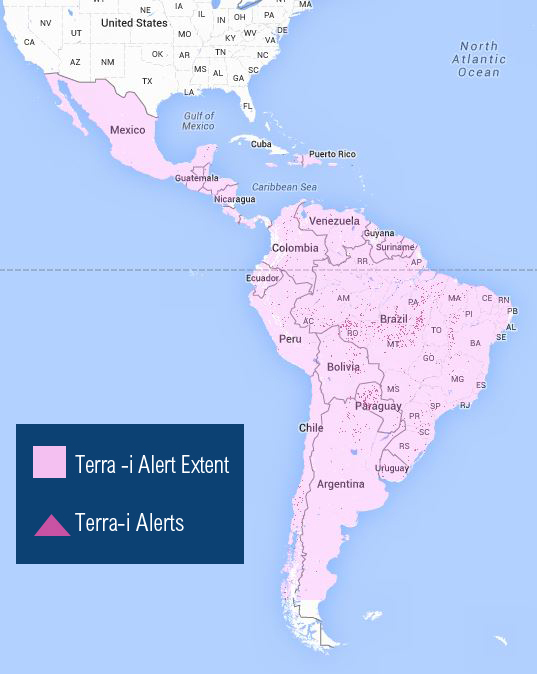 The Ministry of Environment in Peru (MINAM) is actually using Terra-i alerts to identify new mining areas. 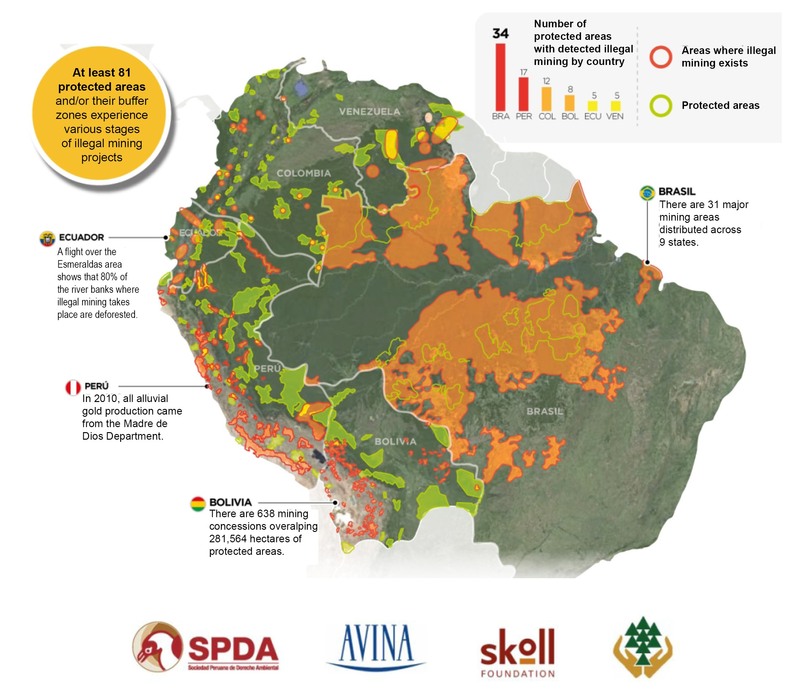 [Sociedad Peruana de Derecho Ambiental](https://www.actualidadambiental.pe/?p=22387) (2014); La Realidad de la Minería Ilegal en Países Amazónicos. Infografía. Con apoyo de AVINA-Skoll. By making Terra-i data accessible to the public, NGOs, academics, and watchdog groups, this new WRI-CIAT collaboration expands GFW’s geographic scope at finer resolution than previously available. Users can visualize, analyze, share Terra-i data through the GFW platform, and apply Terra-i to forest threats in Latin America. Terra-i data can be downloaded directly from their website.